Two teams of astronomers using the NASA/ESA Hubble Space Telescope have discovered three distant exploding stars that have been magnified by the immense gravity of foreground galaxy clusters, which act like "cosmic lenses". These supernovae offer astronomers a powerful tool to check the prescription of these massive lenses. Massive clusters of galaxies act as “gravitational lenses” because their powerful gravity bends light passing through them . This lensing phenomenon makes faraway objects behind the clusters appear bigger and brighter — objects that might otherwise be too faint to see, even with the largest telescopes. The new findings are the first steps towards the most precise prescription — or map — ever made for such a lens. How much a gravitationally lensed object is magnified depends on the amount of matter in a cluster — including dark matter, which we cannot see directly . Astronomers develop maps that estimate the location and amount of dark matter lurking in a cluster. These maps are the lens prescriptions of a galaxy cluster and predict how distant objects behind a cluster will be magnified when their light passes through it. But how do astronomers know this prescription is accurate? 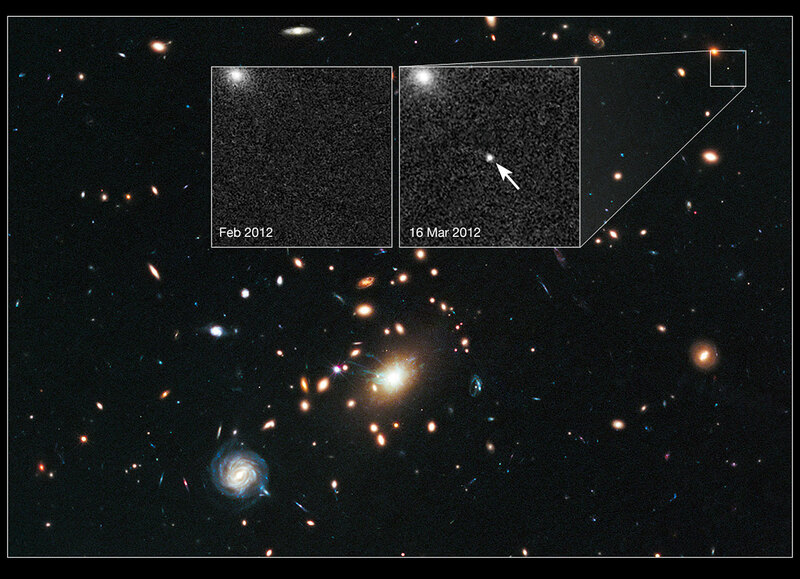 Now, two independent teams of astronomers from the Supernova Cosmology Project and the Cluster Lensing And Supernova survey with Hubble (CLASH) have found a new method to check the prescription of a gravitational lens. They analysed three supernovae — nicknamed Tiberius, Didius and Caracalla — which were each lensed by a different massive galaxy cluster — Abell 383, RXJ1532.9+3021 and MACS J1720.2+3536, respectively. Luckily, two and possibly all three of these supernovae appeared to be a special type of exploding star that can be used as a standard candle . “Here we have found Type Ia supernovae that can be used like an eye chart for each lensing cluster,” explained Saurabh Jha of Rutgers University, USA, a member of the CLASH team. “Because we can estimate the intrinsic brightness of the Type Ia supernovae, we can independently measure the magnification of the lens, which is not possible with other background sources." The teams measured the brightnesses of the lensed supernovae and compared them to the explosion's intrinsic brightness to calculate how much brighter the exploding stars' were made due to gravitational lensing. One supernova in particular stood out, appearing to be about twice as bright as would have been expected if not for the cluster's magnification power. The three supernovae were discovered in the CLASH survey, which used Hubble to probe the distribution of dark matter in 25 galaxy clusters. 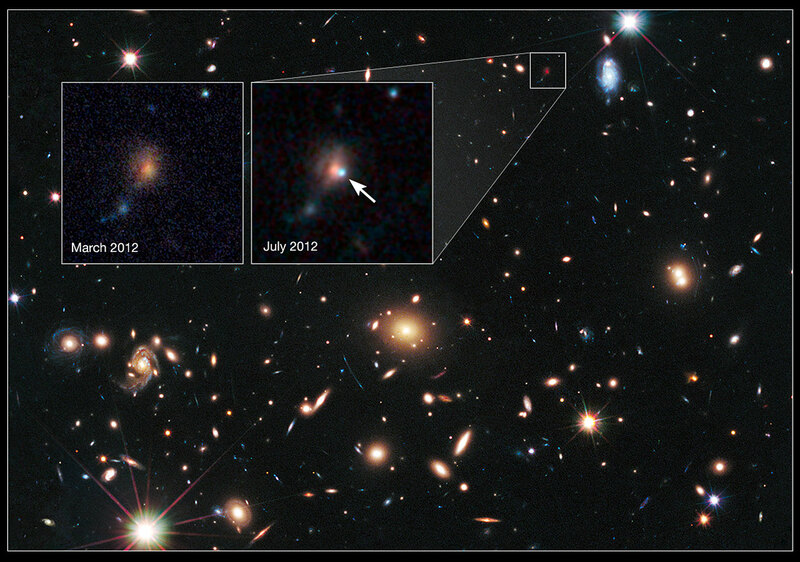 Two of the supernovae were found in 2012; the other in 2010 to 2011. To perform their analyses, both teams used Hubble observations alongside observations from both space and ground-based telescopes to provide independent estimates of the distances to these exploding stars . In some cases the observations allowed direct confirmation of a Type Ia pedigree. In other cases the supernova spectrum was weak or overwhelmed by the light of its parent galaxy. In those cases the brightening and fading behaviour of the supernovae in different colours was used to help establish the supernova type. Each team compared its results with independent theoretical models of the clusters' dark matter content. They each came to the same conclusions: that the predictions fit the models. “It is encouraging that the two independent studies reach quite similar conclusions,” explained Supernova Cosmology Project team member Jakob Nordin of the E.O. Lawrence Berkeley National Laboratory (Berkeley Lab) and the University of California, Berkeley. “These pilot studies provide very good guidelines for making future observations of lensed supernovae even more accurate.” Nordin is the lead author on the team's science paper describing the findings. “Building on our understanding of these lensing models also has implications for a wide range of key cosmological studies,” added Supernova Cosmology Project leader Saul Perlmutter of Berkeley Lab and the University of California, Berkeley. “These lens prescriptions yield measurements of the cluster masses, allowing us to probe the cosmic competition between gravity and dark energy as matter in the Universe gets pulled into galaxy clusters.” Dark energy being a mysterious and invisible energy that is accelerating the Universe's expansion. The astronomers are optimistic that Hubble surveys such as Frontier Fields and future telescopes, including the infrared James Webb Space Telescope, will find more of these unique exploding stars. This is important as if you want to check the prescription of your lens, you really want to check it in more than one place. 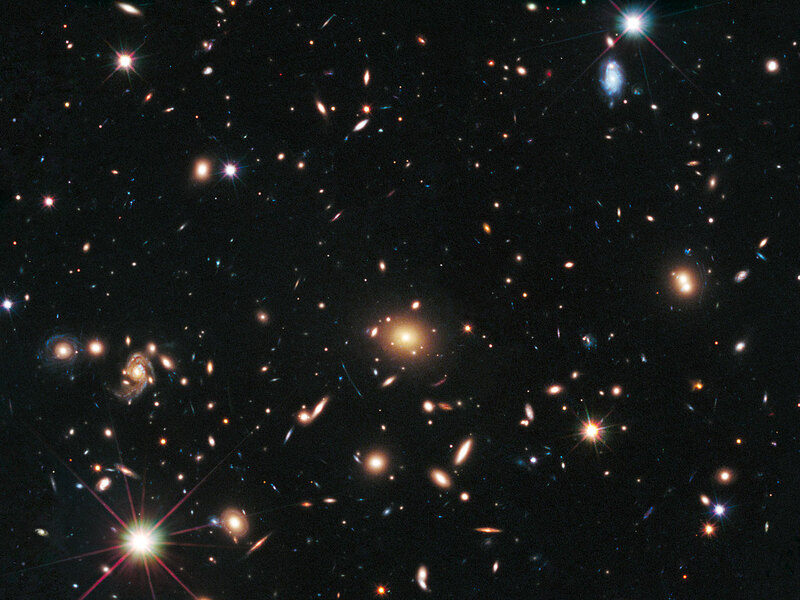 “Hubble is already hunting for them in the Frontier Fields, a three-year Hubble survey of the distant universe which uses massive galaxy clusters as gravitational lenses, to reveal what lies beyond them” said CLASH team member Brandon Patel of Rutgers University, the lead author on the science paper announcing the CLASH team's results. The results from the CLASH team will appear in the May 2014 issue of The Astrophysical Journal. The Supernova Cosmology Project's findings will appear in the May 2014 edition of the Monthly Notices of the Royal Astronomical Society. Albert Einstein predicted this effect in his theory of general relativity. Dark matter is believed to make up the bulk of the Universe's matter, and is therefore the source of most of a cluster's gravity. An astronomical "standard candle" is any type of luminous object whose intrinsic power is so accurately determined that it can be used to make distance measurements based on the rate the light dims over astronomical distances. 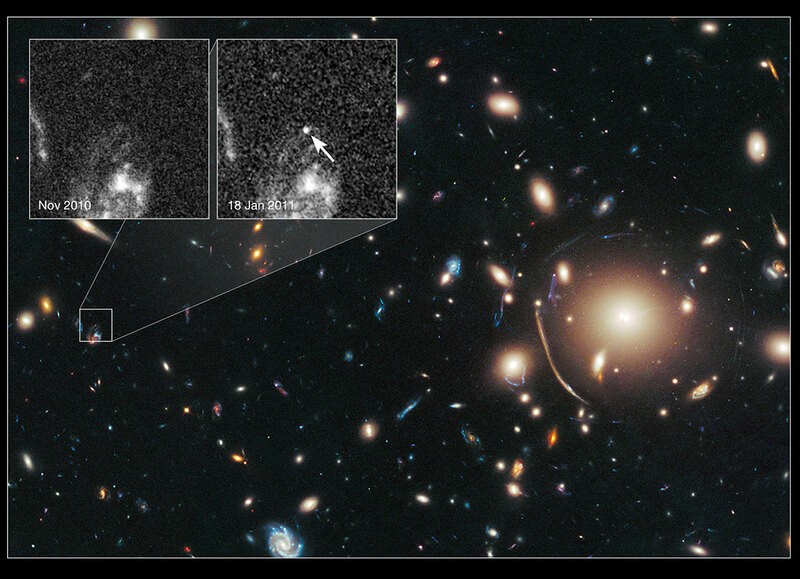 The astronomers obtained observations in visible light from Hubble's Advanced Camera for Surveys and in infrared light from the Wide Field Camera 3. The work is published in two papers, the CLASH team in The Astrophysical Journal and the Supernova Cosmology Project's findings in Monthly Notices of the Royal Astronomical Society. The CLASH survey is led by Marc Postman of the Space Telescope Science Institute. The CLASH supernova project is co-led by Adam Riess of the Space Telescope Science Institute and Johns Hopkins University and Steven Rodney of Johns Hopkins University. Aiding with the analysis on this Hubble study are Curtis McCully of Rutgers University and Julian Merten and Adi Zitrin of the California Institute of Technology in Pasadena. Lead author of the paper was Brandon Patel. The Supernova Cosmology Project included Jakob Nordin and Saul Perlmutter and others who worked on the supernovae analysis are David Rubin of Florida State University in Tallahassee and Greg Aldering of Lawrence Berkeley National Lab.